بشیری گودرزی, میلاد, هاشمی, مرتضی, جمشیدی, امین. (1397). بررسی قابلیت پارامترهای مختلف امواج التراسونیک در ارزیابی ویژگی های فیزیکی و مکانیکی و دوام سنگ های کربناته. نشریه انجمن زمین شناسی مهندسی ایران, 11(2), 81-98. میلاد بشیری گودرزی; مرتضی هاشمی; امین جمشیدی. "بررسی قابلیت پارامترهای مختلف امواج التراسونیک در ارزیابی ویژگی های فیزیکی و مکانیکی و دوام سنگ های کربناته". نشریه انجمن زمین شناسی مهندسی ایران, 11, 2, 1397, 81-98. بشیری گودرزی, میلاد, هاشمی, مرتضی, جمشیدی, امین. (1397). 'بررسی قابلیت پارامترهای مختلف امواج التراسونیک در ارزیابی ویژگی های فیزیکی و مکانیکی و دوام سنگ های کربناته', نشریه انجمن زمین شناسی مهندسی ایران, 11(2), pp. 81-98. بشیری گودرزی, میلاد, هاشمی, مرتضی, جمشیدی, امین. بررسی قابلیت پارامترهای مختلف امواج التراسونیک در ارزیابی ویژگی های فیزیکی و مکانیکی و دوام سنگ های کربناته. نشریه انجمن زمین شناسی مهندسی ایران, 1397; 11(2): 81-98. در این تحقیق با تحلیل سیگنال امواج التراسونیک و استخراج پارامترهای مختلف التراسونیک در نه سنگ کربناته متعلق به مناطق مختلف ایران، قابلیت این پارامترها در تعیین و ارزیابی ویژگی های فیزیکی و مکانیکی و دوام سنگ ها مورد بررسی قرار گرفت. برای این منظور در ابتدا ویژگی های پتروگرافی، فیزیکی و مکانیکی سنگ های مورد مطالعه تعیین شد و سپس برای تعیین دوام، این سنگ ها در معرض آزمایش دوام شکفتگی تا 15 چرخه و آزمایش دوام در مقابل چرخه های متوالی تر و خشک شدن تا 50 چرخه قرار گرفتند. همچنین با استفاده از یک دستگاه دقیق التراسونیک با قابلیت ثبت سیگنال موج، سنگ ها قبل و بعد از چرخه های تر و خشک شدن مورد آزمایش التراسونیک قرار گرفتند و پارامترهای مختلف التراسونیک شامل سرعت موج تراکمی (VP)، دامنه حداکثر موج (Amax)، میرایی فاصله ای موج (αs) و میرایی زمانی موج (αt) از سیگنال های ثبت شده، تعیین و استخراج گردید. بررسی رابطه بین پارامترهای التراسونیک و ویژگی های سنگ های مورد مطالعه نشان می دهد هر یک از پارامترهای التراسونیک قابلیت های متفاوتی دارند به نحوی که در تعیین ویژگی های فیزیکی و مکانیکی VPقابلیت بیشتری دارد. از طرف دیگر دو پارامتر Amax و αs قابلیت بیشتری در ارزیابی دوام سنگ‌ها دارند و توسعه ریزترک های ناشی از چرخه های تر و خشک شدن و پیشرفت هوازدگی در سنگ را بهتر از VP آشکار می کنند. با اصلاح αt به αtc این پارامتر نیز می تواند به خوبی پیشرفت هوازدگی در سنگ را آشکار کند. 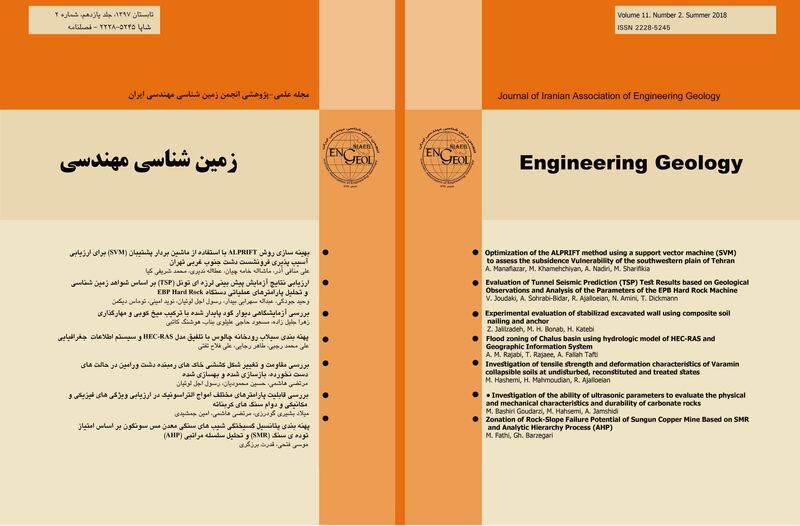 In this research by analyzing the signals of ultrasonic waves and obtaining the ultrasonic parameters in nine carbonate rocks from different parts of Iran, the ability of these parameters to assess the physical and mechanical properties and durability of rocks was investigated. For this purpose, firstly the petrographic, physical and mechanical properties of studied rocks were determined and then, in order to determine the durability of samples, long-term weathering tests of slake durability and wetting-drying up to 15 and 50 cycles were carried out, respectively. Moreover, a precise ultrasonic device capable to record wave signal was used and ultrasonic parameters of compressional wave velocity (VP), maximum amplitude (Amax), spatial attenuation (αs), and temporal attenuation (αs) were determined from recorded signals, before and after wetting-drying cycles. Results indicated that each of the ultrasonic parameters has different capabilities in rock characterization, such as VP can assess both physical and mechanical properties more accurate in comparison with other ultrasonic parameters. Results also indicated that Amax and αs detect the development of the microcracks resulted from wetting-drying cycles and the development of weathering within rocks more better than VP. On the other hand, αt is not sensitive to the weathering development in rock, while if this parameter is corrected and converted to αtc, it can detect the development of weathering within rocks. Andriani, G.F., Germinario, L., 2014. Thermal decay of carbonate dimension stones: fabric, physical and mechanical changes, Environmental Earth Sciences, 72: 2523-2539. Anon, 1979. Classification of rocks and soils for engineering geological mapping. part 1: Rock and soil materials, Bulletin of Engineering Geology and the Environment, 19: 355-371. ASTM., 1994. Annual book of ASTM standards, soil and rock, building stones, Sect. 4, construction. Azimian, A., Ajalloeian, R., 2015. Empirical correlation of physical and properties of marly rocks with p wave velocity, Arabian Journal of Geosciences, 8(4): 2069-2079. Benavente, D., Martínez-Martínez, J., Jáuregui, P., Rodríguez, M.A., García-del-Cura, M.A., 2006. Assessment of the strength of building rocks using signal processing procedures, Construction and Building Materials, 20: 562-568. Benavente, D., Pla, C., Cueto, N., Galvañ, S., Martínez-Martínez, J., García-del-Cura, M.A., Ordóñez, S., 2015. Predicting water permeability in sedimentary rocks from capillary imbibition and pore structure, Engineering Geology, 195: 301-311. Bieniawski, Z.T., 1989. Engineering rock mass classifications: a complete manual for engineers and geologists in mining, civil, and petroleum engineering: New York, Wiley, xii, 251 p. p.
De Kock, T., Turmel, A., Fronteau, G., Cnudde, V., 2017. Rock fabric heterogeneity and its influence on the petrophysical properties of a building limestone: Lede stone (Belgium) as an example, Engineering Geolology, 216: 31-41. Franklin, J.A., Chandra, R., 1972. The slake-durability test, International Journal of Rock Mechanics and Mining Sciences, 9: 325-341. Gamble, J.C., 1971. Durability-plasticity classification of shale and other argillaceous rocks. PhD theses, University of Illinois. Ghafoori, M., Rastegarnia, A., Lashkaripour, GM., 2018. Estimation of static parameters based on dynamical and physical properties in limestone rocks, Journal of African Earth Sciences, 137: 22-31. Gökceoğlu, C., Ulusay, R., Sönmez, H., 2000. Factors affecting the durability of selected weak and clay-bearing rocks from Turkey, with particular emphasis on the influence of the number of drying and wetting cycles, Engineering Geology, 57: 215-237. Hashemi, M., Bashiri Goudarzi M., Jamshidi, A., 2018. Experimental investigation on the performance of Schmidt hammer test in durability assessment of carbonate building stones against freeze–thaw weathering, Environmental Earth Sciences, 77:684. ISRM., 1981. Rock characterization, testing, and monitoring, ISRM suggested methods. Pergamon Press, Oxford. Jamshidi, A., Nikudel, M.R., Khamehchiyan. M., Zarei Sahamieh, R., Abdi, Y., 2016. A correlation between P-wave velocity and Schmidt hardness with mechanical properties of travertine building stones, Arabian Journal of Geosciences, 9: 568. Karakul, H., Ulusay, R., 2013. Empirical correlations for predicting strength properties of rocks from P-wave velocity under different degrees of saturation, Rock Mechanics and Rock Engineering, 46 (5): 981-999. Loubser, M., 2013. Weathering of basalt and sandstone by wetting and drying: A process isolation study, Geografiska Annaler: Series A, Physical Geography, 95: 295-304. Martínez-Martínez, J., Benavente, D., García-del-Cura, M.A., 2011. Spatial attenuation: The most sensitive ultrasonic parameter for detecting petrographic features and decay processes in carbonate rocks, Engineering Geology, 119: 84-95. Martínez-Martínez, J., Benavente, D., García-del-Cura, M.A., 2012. Comparison of the static and dynamic elastic modulus in carbonate rocks, Bulletin of Engineering Geology and the Environment, 71: 263-268. Martínez-Martínez, J., Benavente, D., Gomez-Heras, M., Marco-Castaño, L., García-del-Cura, M.A., 2013. Non-linear decay of building stones during freeze–thaw weathering processes, Construction and Building Materials, 38: 443-454. Pappalardo, G., 2015. Correlation between P-wave velocity and physical–mechanical properties of intensely jointed dolostones, Peloritani Mounts, NE Sicily, Rock Mechanics and Rock Engineering, 48 (4): 1711-1721. Ruedrich, J., Kirchner, D., Siegesmund, S., 2011. Physical weathering of building stones induced by freeze–thaw action: a laboratory long-term study, Environmental Earth Sciences, 63: 1573-1586. Sumner, P., Loubser, M., 2008. Experimental sandstone weathering using different wetting and drying moisture amplitudes, Earth Surface Processes and Landforms, 33: 985-990. Vasanelli, E., Colangiuli, D., Calia, A., Sileo, M., Aiello, M.A., 2015. Ultrasonic pulse velocity for the evaluation of physical and mechanical properties of a highly porous building limestone, Ultrasonics, 60: 33-40. Vazquez, P., Alonso, F.J., Carrizo, L., Molina, E., Cultrone, G., Blanco, M., Zamora, I., 2013. Evaluation of the petrophysical properties of sedimentary building stones in order to establish quality criteria, Construction and Building Materials, 41: 868-878. Villarraga, C.J., Gasc-Barbierb, M., Vaunata, J., Darrozesc, J., 2018. The effect of thermal cycles on limestone mechanical degradation, International Journal of Rock Mechanics and Mining Sciences, 109: 115-123. Wang, P., Xu, J., Fang, X., Wang, P., Zheng, G., Wen, M., 2017. Ultrasonic time-frequency method to evaluate the deterioration properties of rock suffered from freeze-thaw weathering, Cold Regions Science and Technology, 143: 13-22.